Found one file extension association related to Diablo BTU Calculator and Reporting Software and 1 file format developed specifically for use with Diablo BTU Calculator and Reporting Software. Developer / company: Diablo Analytical, Inc.
Diablo BTU Calculator and Reporting Software is a simple, easy-to-use, yet flexible BTU calculating and chromatography reporting software solution. 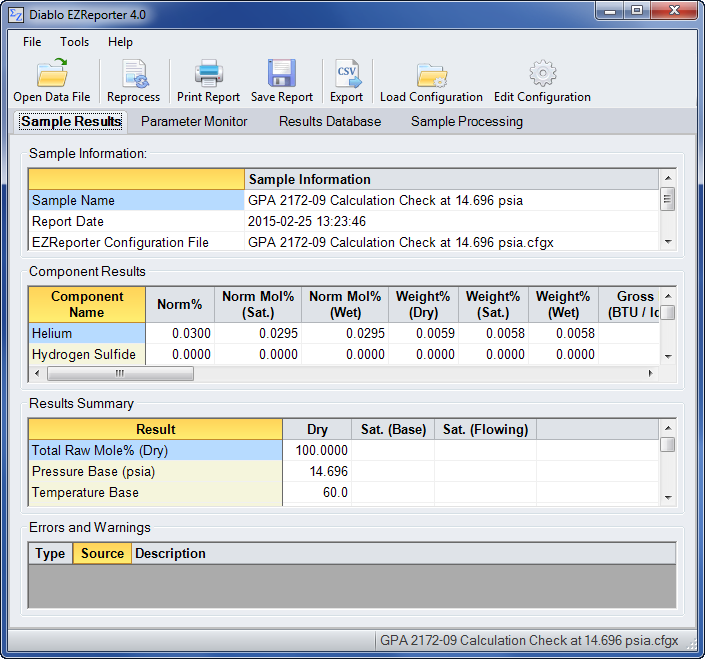 The Diablo BTU Calculator is a simple, easy-to-use, yet flexible BTU Calculating and Reporting Software solution for the Agilent Technologies EZChrom Elite and Cerity Chromatography data systems. Although the software was originally designed to perform standard BTU/energy calculations, it also includes capabilities that are of interest to general chromatography users including flexible export of results to text files, alarming, and historical trend plotting of results. The Diablo BTU Calculator and Reporting Software software seems to be old or discontinued. If you need more information please contact the developers of Diablo BTU Calculator and Reporting Software (Diablo Analytical, Inc.), or check out their product website.